Tifferz & Her Sisterz Book Reviewz: Gratitude Givaway!!!!! Welcome to my giveaway! All you need to do is become a follower of my blog with Google Friend Connect (old and new followers welcome) and leave a comment with your email address to enter the giveaway! One entry per person! The contest is open and will run till midnight on Nov. 27th any and all comments after midnight will not be counted. ONE random winner will be chosen and will receive a ARC paperback copy of Tiger's Voyage By Colleen Houck (the third book in the series) I will email the winner for an address to send it. Good Luck! Fraught with danger, filled with magic, and packed with romance, Tiger's Voyage brings Kelsey and her two tiger princes one step closer to breaking the curse. You all know I love this series and feel everyone should read it. Each book gets better and better and this one does not disappoint. Colleen writing is pure magic and simply flawless. The story continues with new adventures and challenges await Kelsey, Ren and Kishan. I loved the dragon's and mermaid and the challenges they have to meet in order to break another part of the curse. It was also inter sting to have Kelsey work with Ren and Kishan on the challenges. I thought she would have to pick one. It makes sense and makes things very interesting. I love how Colleen has developed the characters. They are not the same as they were in book one. It is has been fun to watch them grow. So, you need to read Tiger's Curse and Tiger's Quest before you read Tigers Voyage. Colleen yet again leaves you wanting more at the end which I love and hate. You get your romance sprinkled with magic and packed with adventure mingled with danger. I am eagerly waiting for book 4 Tiger's Destiny which comes out July 2012! I must have series. Highly recommend for ages over 10. No bad language and just kissing. This was a ARC copy! I am new to this, so I just signed up to do this for you.. My e-mail is Kozinu @ gmail.com and my name, maybe my GFC? Is Amber Parchym, I also go by Kozi. I have really been wanting a ARC of this book. Thank You for the chance to win one. I just became a member of your blog, even though I have visited on many occasion.Thank you. oooh, I have read the first two books in the series, I can't wait to read this one! Have a safe and awesome early weekend!! I was sure I left a post for this giveaway already but I don't see it here so I'll add one more. Thanks! I'm a follower. Thank you for the great giveaway. Have a happy Thanksgiving! I'm reading the first book and have the 2nd on my Christmas list. I love her writing and the story! I didn't know there were four books. The trilogy has given way to the foursome. Ah well, more goodness for us! Much thanks for the fun giveaway! Would love to get this. Thanks! Have a blessed Thanksgiving! Oooh this sounds really good. I'll definitely have to look into this series. Thanks so much for the chance and have a wonderful Thanksgiving! It sounds like an interesting book, I'd love to read it. Thank you for the excellent giveaway. That sounds like an interesting book! Thanks for having such a great giveaway! OMG want to read the book. Thanks for the giveaway. 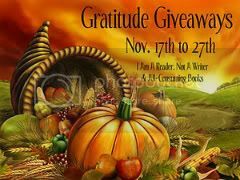 I follow as Stacy T.
love this giveaway, hope I win a few great books for christmas! Oh, cool! I've been wanting to read this.